Analog signal Jammer:At any one time, scanning at a certain frequency to scan the single-frequency strong signal suppression. Digital  source jammer:At any time, the same bandwidth as the interference signal is generated, the noise is mixed into the useful signal, the signal to noise ratio of the receiver is degraded, the communication terminal is induced to analyze the error signal, and the interference effect is realized. Analog signal Jammer:Under the same conditions, the   jamming power for 100 watts can interfere with 50---100 meters, and when the transmit power is increased to a certain extent, to increase the transmission power can not improve the jamming range. 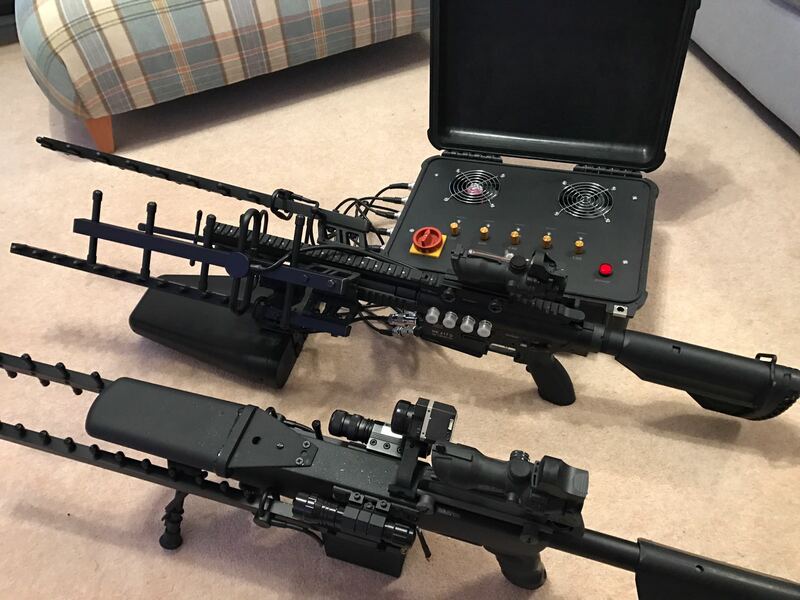 Digital  source jammer:Under the same conditions, interference emission power of 25 watts interference 200 --- 300 meters (mobile phone signal ) if for drone jammer the range should be 2000~3000M, and with the interference of the transmission power increases, the interference range also increases. Analog signal Jammer:The narrow-band signal has a certain interference effect. Communication signals based on CMDA (e.g., CDMA / WCDMA / 4G) have poor interference. Because CMDA (Code Division Multiple Access) technology based communication signals with spread-spectrum gain, there is a very strong anti-jamming. Interference of such signals, the usual practice is to significantly increase the interference emission power, destructive interference. Digital  source jammer:The interference effect on the narrowband signal is far greater than the jammer of the analog interference source. Based on the CMDA (Code Division Multiple Access) technology-based communication signals with other sources of interference can not match the superiority. Jammers that employ this technique apply communications signals of any technology and do not require excessive interference with the transmit power. Analog signal Jammer: under Long-term work condition , due to the interference source drift, interference performance. Disturbance performance is affected by changes in the external environment, interference area and range are prone to fluctuations (such as wind, rain, space object disturbance). Digital  source jammer: In the long-term working condition, the interference source is stable. Analog signal Jammer:For a large area of long-range interference requirements, the equipment is very heavy and bulky, the need for a huge power supply system, can not be miniaturized equipment. Digital  source jammer: For long-range large-scale interference requirements, the device can be done very small, suitable for mobile and portable, without a huge power supply system. Analog signal Jammer:As the internal RF amplification link low efficiency, resulting in additional energy consumption, long-term reliability of the equipment has a serious negative effect. Digital  source jammer:  High efficiency, resulting in less additional energy consumption, long-term reliability of the equipment is much higher than the analog jammer interference.